At NASA’s Kennedy Space Center Shuttle Landing Facility in Florida, Chad Stout with C Spray Glass Blasting in Cocoa, Fla., installs the plaque marking the final nose gear wheel stop of space shuttle Atlantis in on July 21, 2011. The marker, installed on June 28, 2012, is the third black granite plaque permanently mounted to commemorate the final landing of each of NASA's three orbiters. "Mission complete, Houston. After serving the world for over 30 years, the space shuttle has earned its place in history. It's come to a final stop." With those words, astronaut Christopher Ferguson signaled the end of the 135th and final shuttle mission on July 21, 2011. Almost a year later, the spot where STS-135 commander Ferguson brought space shuttle Atlantis to its "wheels stop" has been marked with a permanent plaque. The 16- by 28-inch (41- by 71-centimeter) black granite marker was installed June 28 alongside Runway 15 at the Kennedy Space Center's Shuttle Landing Facility (SLF) in Florida. It was the third similarly-designed plaque added to mark where NASA's three retired winged orbiters had come to their final resting stops after each of their last spaceflights. Like the granite tablets that were earlier installed for sister ships Discovery and Endeavour, Atlantis' marker features an engraved depiction of the space shuttle landing, along with the date of its final touchdown and how far it traveled down the runway. The plaque also notes the number of missions Atlantis flew (33), its total days in space (307) and miles flown while orbiting the Earth (126 million). Workers measured and marked in bright red the letters "MLG" at the spot where space shuttle Atlantis' main landing gear came to rest after the vehicle's final return from space. When Atlantis landed in July 2011, the locations where its nose and main landing gear came to a halt were marked on the runway using spray paint. Last month, that freehand notation was removed and replaced with a smaller, stenciled note. Atlantis' plaque was positioned parallel to the painted notation at the edge of the runway so as not to interfere with the strip's continued and future use by air and spacecraft. The plaques were created and installed for NASA by C Spray Glass Blasting of Cocoa Beach, Fla. The project to install the markers began last year under former space shuttle launch integration manager Michael Moses working with Kennedy employees Mike Ciannilli, Melissa Jones, Dean Schaaf and Malcolm Glenn. Atlantis' final, final stop will come this November when it will be rolled over to the nearby Kennedy Space Center Visitor Complex for display. The orbiter's new $100 million, 65,000-square-foot exhibit is set to open to the public in summer 2013. 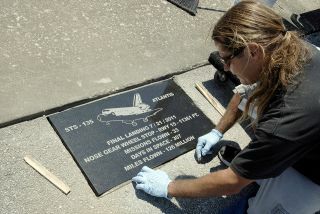 Click through to collectSPACE.com to see more photos of the plaque marking space shuttle Atlantis’ final wheel stop.